The most important and most visible feature in Fedora 18 is going to be the new user interface for the installer, Anaconda. It was a major change and it needed a major fixing effort, which was the cause for repeated schedule changes (the final release will come with an over 2 months delay). Since the Beta version was released earlier this week, anyone can perform an install and experiment the new look and feel. 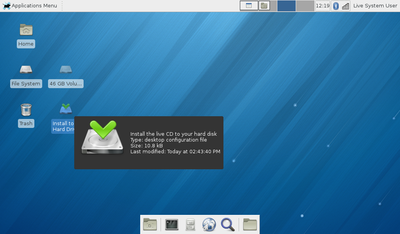 Below is a series of screenshots (click for large size view) captured during my install of the Xfce spin (the steps should be identical for the other spins). I repeat: this is the Beta release. So I copied the Xfce spin to an USB stick and booted from it to a working device. There is the expected "Install to Hard Drive" icon - that's the case for all "live" spins for a long while. Then is the pre-release warning in a humorous tone, in the stile of old text-based adventure games. A good thing. Still... I thought is only one month in the future. Do someone know something I don't? I booted from the USB stick with the purpose of performing an install, so the network wasn't configured. 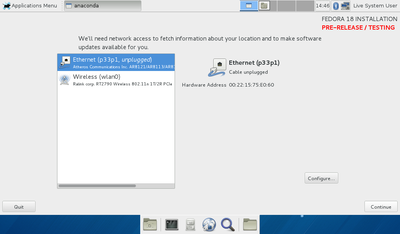 Now the installer asked to set-up the network. A good thing, I may be able to customize the package set, add other repos (Rpmfusion and get done with everything in one go). Only it didn't... it wasn't possible to customize the set and it wasn't possible to add repos. A regression, we used to be able to do that. Then it goes to the main installer screen, where the redesign can be seen: instead of a "wizard" approach, where you follow the steps in serial order, from one to another, now it is a "hub", from the main page you can go to various config sections, complete them and go back. The section that must be filled are marked with an orange sign, the other are optional. 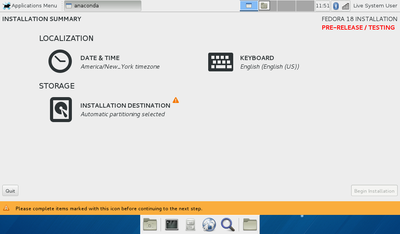 A hub for only 3 options, 2 of which are totally minor (keyboard layout and timezone) is overkill. The future will probably add more, still I am not convinced about the benefits, I still used it as a wizard. In the looks, there can be noted the extremely simplistic and monochrome, Windows 8 style, icons, which do not look like icons or buttons. The first option to edit is the time zone selection. From all the install experience it is my favorite part and a good change. In the old Anaconda the widget was small with the need to unintuitively zoom the world map. Now is easier. Still, the position, caption and shape of the "Done" button is not inspired and is a flaw to be found in every similar configuration screen. I have to witness I had to hunt for it, I expected a bigger, more visible button in the bottom-right corner. The keyboard layout section is the same, very simple (was an entire screen needed?) with the "Done" button in the same unexpected place. The less pleasant part part was when selecting the proper layout for the Romanian language (still, the problem isn't new). Can you tell which is the right one? It was not my first Fedora install, so I happened to know (hint: it would be a good idea to put the option needed by most users the first, not the last). 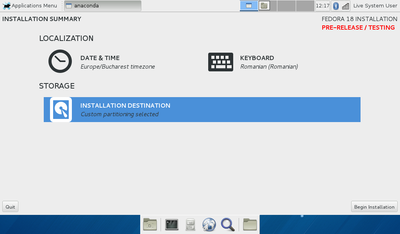 The destination selection screen follows the same convention but it is a small wizard in itself, with a "Continue" button in the "right" place. Why do I have to jump to opposite screen corners for buttons? The "wizard" mode is interrupted by a pop-up where you set some partitioning options. There is also a disabled "Modify software selection" button, hovering it the tooltip says "Please wait... software metadata still loading". No matter how long you wait, the button won't get enabled, you won't customize a thing. I didn't go in depth with partitioning, just re-used the old partitions from the previous Fedora 17 install. Another minor part: that "Unknown" partition is not unknown, is a W I N D O W S partition (GRUB will recognize and use it), why not label it as such here? The old Anaconda did... and this brings me to the bigger complaint: the GRUB setup screen is gone and I need it: my computer at home is going to be shared by two persons, one (me) booting in Linux and the other in Windows. For her, it has to go in Windows by default. Regression. I will have to adjust it by hand post-install. While files are copying, you are asked to set a root password. In the famous Anaconda way, the progression indicator has a rhythm of its own, unrelated with anything. When the bar s full the installation ended successfully, there is a button to reboot in the newly installed system. time setup, which I already did in the Anaconda interface. Is redundant. 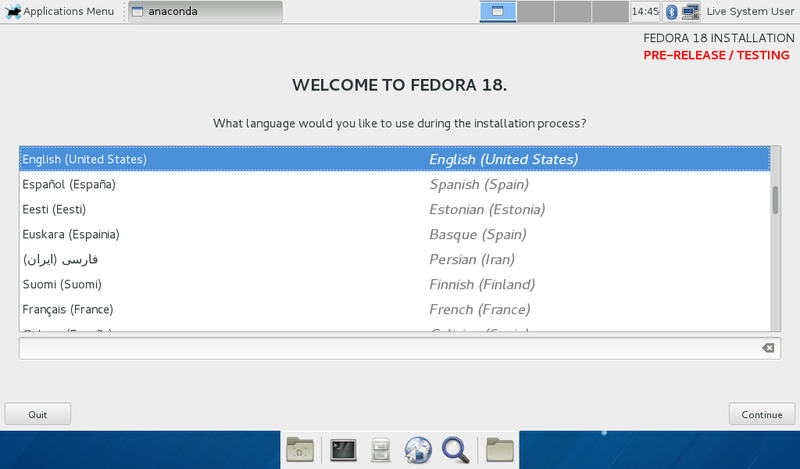 Since the features are supposed to be ready by a Beta release, expect the experience in the Fedora 18 final release not to be far from this. Quite crappy design - I was expecting a better copy of the ubuntu installer, I can't believe that we are waiting for this to get fixed. i witness my lack of knowledge about the Ubuntu installer, it also has a "hub" flow? In this case, making sure the installer works properly is very important than polishing. Anaconda installer beats in term of functions and feature there is no comparison. actually Luya the feature was poorly planned and implemented. Anaconda is core to the distro functionality and you are supposed to merge such things only when sure you don't break things and always with a contingency plan - which was NOT the case now. The new Anaconda is simply awful. I don't mean the UI per se, I'm not picky about that. I mean the fact that it refuses to tell you exactly what it's going to do and expects you to just go along. I read the forums and the devs' touchy explanations of how it works and I still had to start over three times before finally giving up and just putting myself at the installer's mercy with no clue what it was going to install where (triple-booted Windows/Fedora/RHEL UEFI/LVM). I've installed dozens of Linux distros hundreds of times over the years and have never come across any installer so horribly off the mark. The best I can say is that it is simply not ready yet for testing and should never have made it into F18. Well I managed to lose all data on my hard drive with the new installer, that's how good it is. Lesson 101, always back up before installation. Lesson 102 - use the proper tool and ditch Fedora like you'd ditch a bad habit. what a piece of sh$%^%$t installer, why did you not post a screen shoot with the package selection - try out the netinstall iso and then get amazed. there is no package selection screenshot in my article sine i encountered no one, the "Modify software selection" button wasn't clickable. I've installed F18 several times, beginning with the alphas, on hardware with three drives. The workflow the designers expect users to follow is not at all obvious. For example, the first few times I used it I did not realize I could click on the "icons" in the "hub" and change things. 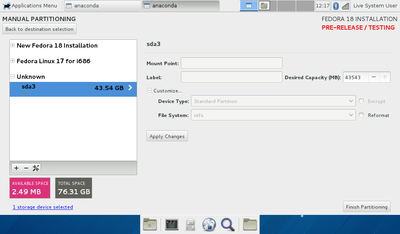 I've never been able to use Anaconda to put specific partitions on specific drives. There is a little "Gear" icon on the manual partitioning display that, I gather from the forums, is supposed to enable this. Does nothing here. So, I pre-partition before I begin the install and Anaconda does see those partitions. 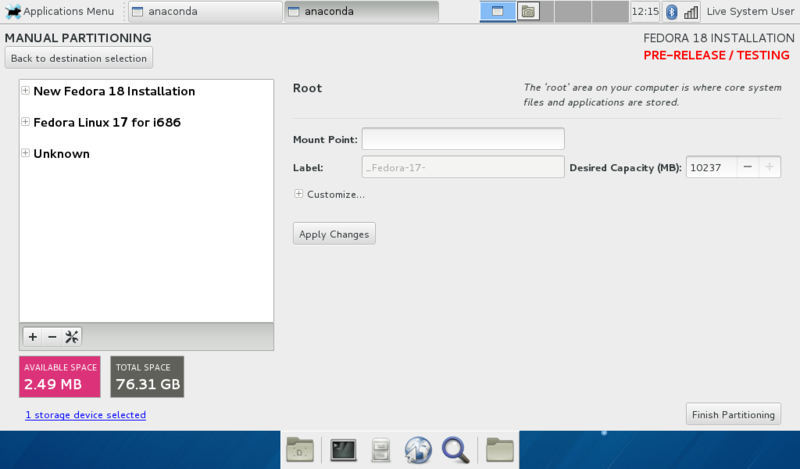 I'm not at all convinced it was necessary to redesign the expected workflow in the manual partitioning part of Anaconda. Just let us pick the drives by device name and get on with things. Meanwhile, I've never been asked to set up the network. The software selection icon is clickable if you use a netinstall or a DVD image and displays a rather nice screen full of options. If you cannot change software selections when install from a live image, then that icon should not be ther. in my case the installer was started from a live image and unconfigured network, that's probably why i was asked to configure it. setting-up the network inside the installer made the connection available for the entire live desktop. I tried installing from the main DVD. 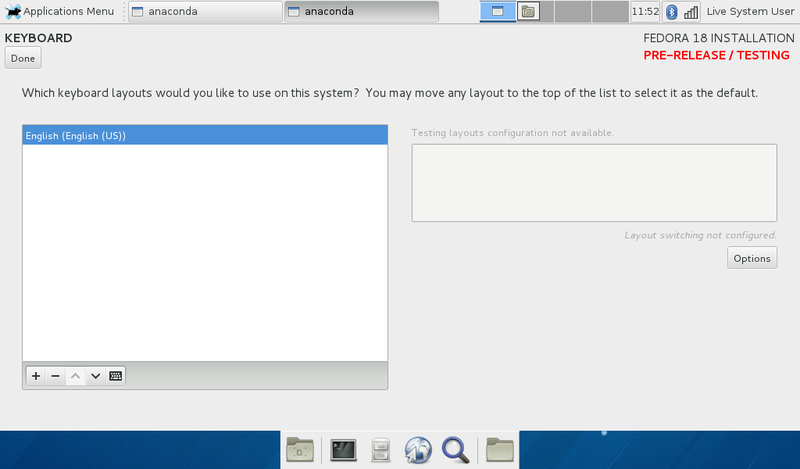 I have to say Anaconda is now absolutely cr@p. In the old Anaconda, I was able to choose which individual packages to install. Now that's not possible. 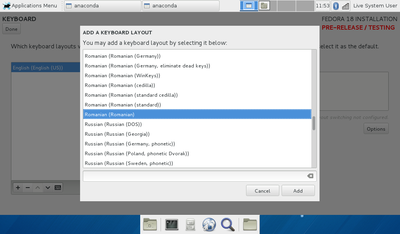 The only options available have names such as 'KDE Applications', 'Media Applications' etc. However, I wouldn't mind this so much if I were actually able to INSTALL Fedora. Every time I tried, Anaconda simply froze, and I had to hold the power button to switch off the computer. It's not surprising that Anaconda is now sh!t, since it is clearly intended to be a GNOME 3 app, from the look of its interface. 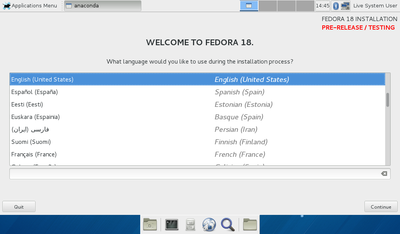 Looks like Fedora Community wants to trash their own distro and render it useless. Well, alright then. Let themselves fade away. 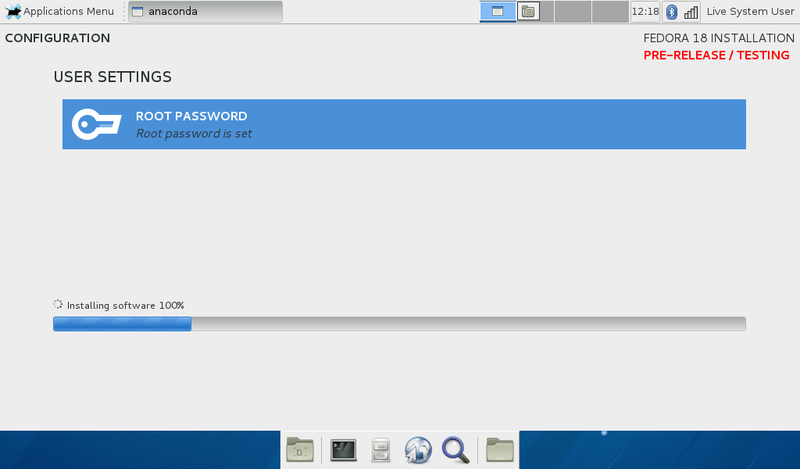 Installed a Fedora 18 live nightly build to usb then on to a Acer Aspire One netbook took less than 10 minutes. 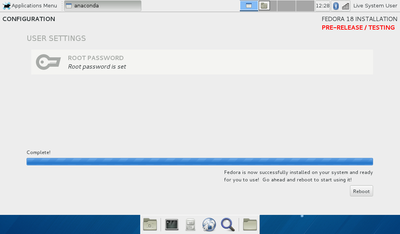 The AAO was previously dual-booting Fedora 17 and XP now Fedora 18 and XP. Just cautiously proceeded through the installer. the pre-releases and reporting your experience in an intelligent manner is what will make it right for the final release. I used Fedora since the very first day they came out to existence and never used any other distro, until... well, GNOME 3. I swear I tried many times to use to it but I can get it, is not natural to me, and is not only Gnome, Nautilus (renamed absolutely wrongly to just "Files"?!) the File Manager, a vital program in any OS had been badly mutilated and modified that is almost unrecognisable and rendered pretty much of little use, why? 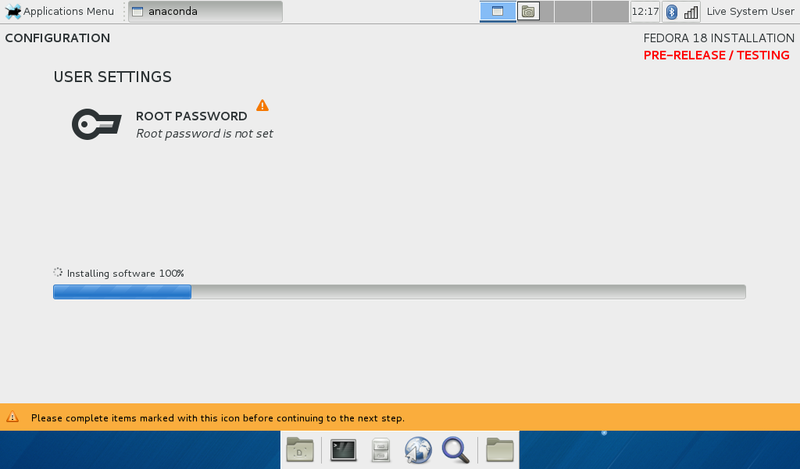 and now the installer Anaconda, they transformed Anaconda from a powerful snake to a ... miserable worm? why imitate Apple OS X/ MS Windows?? to summarize, I testing now Mint in my laptop and I will switch my Fedora desktop to either Debian or Arch, Fedora is not longer a necessity for me. 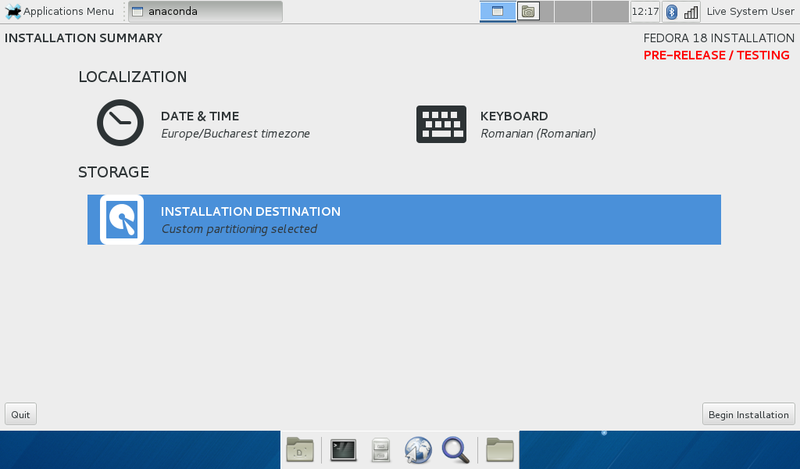 have you tried MATE with Fedora? i find it quite pleasant to use, is making Fedora again usable on the desktop for me. 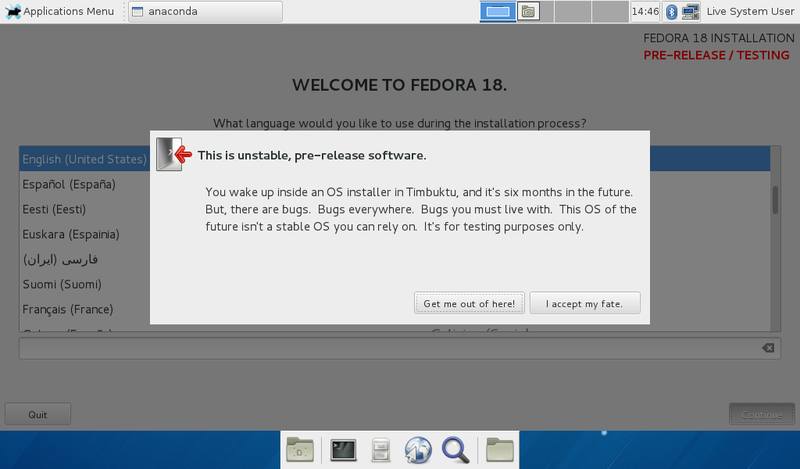 Fedora and Opensuse is now trying to expand their user base and not confine themselves to a few thousand highly technical people.